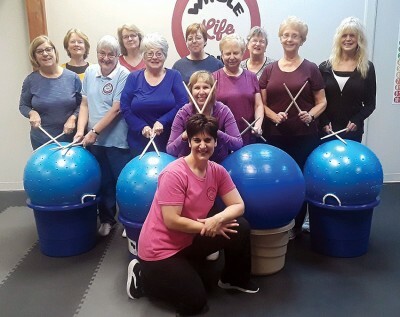 Co-owner of Whole Life Fitness Stephanie Jacob (front) poses with Whole Life Fitness members along with their drum sticks and the exercise balls they’ll be using for the upcoming cardio drumming classes, which begin Monday. Upper Sandusky gym Whole Life Fitness will begin offering a new rhythmic way to get in shape on Monday with cardio drumming classes. “Basically what it is is a big body ball that sits on a stand or a base or in our case, a laundry basket with nylon handles but the exciting part is you get real drum sticks,” WLF co-owner Stephanie Jacob said. Jacob said cardio drumming incorporates body weight exercises like squatting and lunging. Benefits of the class are improvements to one’s rhythm, coordination, stamina and balance. “Drumming makes you feel better both physically and mentally,” Jacob said. Jacob added that anyone can do cardio drumming, regardless of age, fitness level and physical limitations. There are modifications to all the moves in case participants can’t fully lunge or squat. “I don’t want anyone to feel intimidated,” Jacob said. Jacob will be the instructor for the class and will offer directions for when to move, when to hit the ball, similar to an aerobics class or silver sneaker class for seniors. Classes are expected to be 30 minutes each. “We thought if we offered something new in February, it’ll help recharge the batteries of people who had New Year’s Resolutions to get healthier this year,” Jacob said. 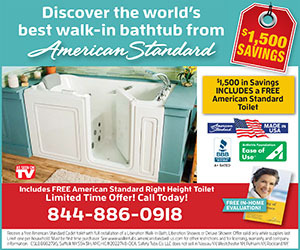 The first class is 9 a.m. Monday morning, which repeats Wednesday and Friday. There is an evening class Tuesday and Thursday, a co-ed class at 1 p.m. Wednesday and even a weekend class at 10:15 a.m. next Saturday. Whole Life Fitness is located at 228 Eighth St., Upper Sandusky. For more information on the cardio drumming classes, call 419-209-1959.